2. On a lightly floured surface, roll out the puff pastry into a 12-inch square, then cut into 4 equal squares. Slightly fold and pinch the edges of each square to form edges. Score dough around edge. Transfer to a baking sheet and prick all over with a fork. Bake until golden, about 8-10 minutes. 3. Remove tart shells from oven and let cool slightly. If centers are very puffy, prick with a fork to deflate. 4. 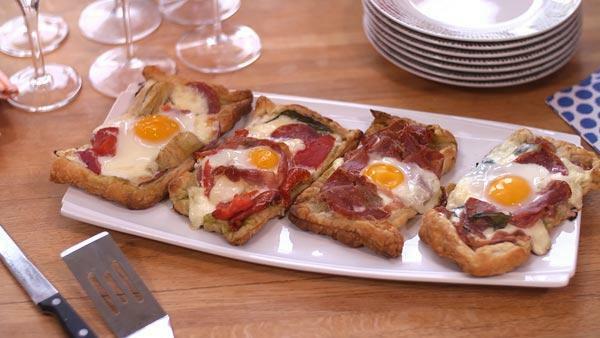 Add any antipasti toppings you'd like to the shell leaving a space in the center for the egg. Crack an egg into the well and season with salt and pepper. 5. Bake the breakfast pizzas a second time to cook the egg for another 10 minutes.